There are several different types of presentations you can make for your product, service or company. It all depends on who your perspective client is, where they are located, what kind of product or service you are offering, and what the client is most comfortable with. Webinar sales presentations are conducted via the Internet. Webinars let those who choose to view the sales presentation watch it on their computer. To access the webinar sales presentation, viewers can either be invited to join a webinar via email or, depending on the type of webinar, they may need to download software that allows them to participate. Webinar sales presentations allow the salesperson to include graphics such as charts and tables to express ideas. These sales presentations are popular because they let you communicate your message to potential clients without traveling. With the high cost of travel, teleconference sales presentations are a good way to keep costs down. A teleconference sales presentation is done over the phone and can include several people. Sometimes it can get confusing, trying to identify who is talking without being able to put a face with a voice, so usually just one salesperson participates in the teleconference. Videoconferencing, such as via Skype, are helpful in cases in which several people need to see one another face to face but a seminar is not feasible. Seminar sales presentations are held in an auditorium or other large venue. 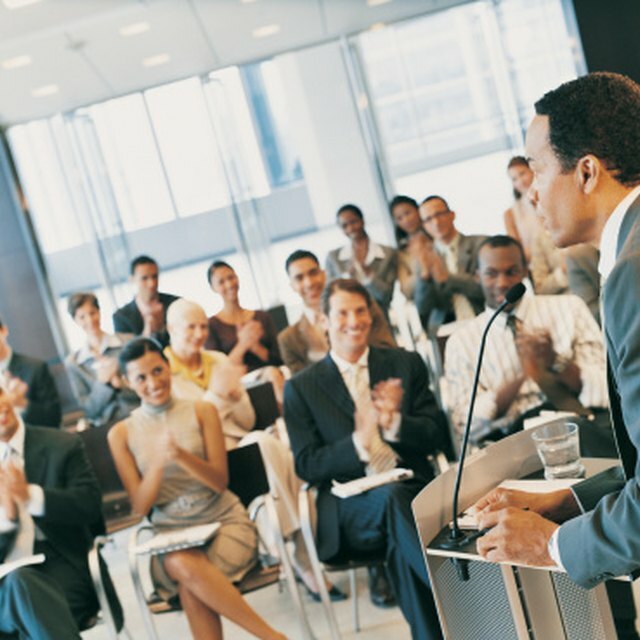 These sales presentations are routinely held to enable you to make your sales pitch to as many people as possible. Usually, the salesperson will stand on a stage or platform giving reasons why listeners should buy his or her product or service. Oftentimes these presentations are scripted and memorized, but sometimes they involve audience participation, allowing attendees to ask questions or somehow be involved in the presentation. In a customized problem-solving sales presentation, the salesperson addresses a problem the potential client has, or might have, and offers a solution that could be provided by his or her product or service. This type of sales presentation is done face to face. Often, the salesperson will use a real-life example to demonstrate how the product or service can help the client. Team sales presentations are those that are performed by more than one person. It can involve any of the previously mentioned forms of sales presentations, however it usually is done in a face-to-face setting. Team sales presentations are usually done when the product or service is complicated or large. Sometimes it takes a few salespeople to get the point across. Based out of Brookfield, Ill., Chris Olvera is a writer and editor with more than 15 years experience. He was editor of Manufactured Home Merchandiser for 10 years. Chris also was an editor for CSP Magazine and of the Villa Park Review. He is a graduate of Columbia College in Chicago.